The NFL’s Week 8 was filled with apologies, anger and anguish. Texans owner Bob McNair and Buccaneers safety T.J. Ward expressed regret for their words. Houston star DeAndre Hopkins and Steelers receiver Martavis Bryant got mad, but only Hopkins channeled that feeling onto the field. 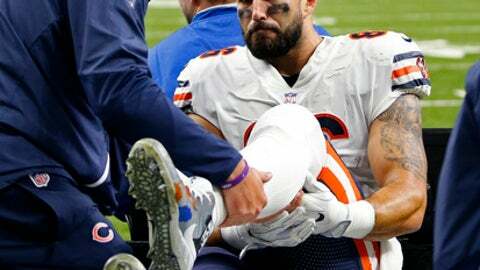 The Chicago Bears cringed as they watched Zach Miller carted off the field with a serious knee injury while officials crossed off his over-the-shoulder touchdown catch. The week began with Baltimore’s 40-0 whitewash of the Dolphins on Thursday night in which starting quarterback Joe Flacco was concussed on a late hit, and his backup was choked by Ndamukong Suh. DOUBLE-WHAMMY : Bears rookie QB Mitchell Trubisky thought he had floated a 25-yard touchdown pass to Miller in New Orleans on Sunday. Instead, the Bears were hit with a double-whammy they could not overcome: a serious knee injury to their tight end a replay reversal with which they disagreed. Miller dislocated his left knee when he landed in the end zone. The gruesome injury, which was replayed several times on the scoreboard, forced the 33-year-old tight end to be carted off and taken to University Medical Center New Orleans, where he underwent emergency surgery to repair a damaged artery and save his leg. Officials ruled after a replay review that the ball hit the ground when Miller bobbled it on his way down. Miller appeared to lose the ball while seated and trying to deal with the pain in his leg. ”I thought he had control the whole time,” argued running back Jordan Howard. FLACCO FLATTENED : The Ravens were angered after watching Flacco being helped off the field, bleeding and disoriented following a late hit by Dolphins linebacker Kiko Alonso. Flacco sustained a concussion after he went into a slide and Alonso hit him, sending his helmet flying. Alonso was flagged but not kicked out. He insisted the hit to the head wasn’t intentional. In the fourth quarter, the oft-fined Suh grabbed Ryan Mallett by the throat after Mallett got in his face for hitting him after an offside whistle. PLAYER PROTEST : Just when the national anthem hubbub had died down a bit and protests were returning to pre-President Trump criticism levels, three dozen Texans took a knee during ”The Star-Spangled Banner” in Seattle. That was in response to McNair’s ”inmates running the prison” comment during NFL meetings about player protests. It was the first time any of the Texans had knelt during the anthem this season. The team stood with arms locked before kickoff on Sept. 24 in New England, the weekend when more than 200 players around the league protested following the president’s barbs. McNair issued two apologies attempting to explain his comments after a report revealed that he said ”we can’t have the inmates running the prison” during a meeting of NFL owners about players who, following the lead of former NFL quarterback Colin Kaepernick, protest social injustices by kneeling during the national anthem. McNair said he wasn’t referring to players but to the relationship between the league office and team owners. Hopkins, who didn’t practice Friday after McNair’s comments came to light, had the second-best game of his career Sunday with 224 yards receiving in the Texans’ 41-38 loss. BRYANT BENCHED : There’s trouble brewing in Pittsburgh even as the Steelers hit their halfway mark at 6-2. Coach Mike Tomlin benched Bryant after his social media outburst following a victory over Cincinnati last weekend. Bryant complained about his role in the offense and insisted he meant no ill will when he suggested on Instagram that he was better than rookie teammate JuJu Smith-Schuster – who caught a 97-yard TD pass in a 20-15 win over the Lions on Sunday. Bryant doubled down during the week, saying he feels he’s better than any receiver he’s ever played with, although he did apologize for being a distraction. WARD’S WORDS : After saying he was at ”wit’s end” over his rotational role in Tampa Bay, Ward said he wished he’d gone straight to his coaches with his complaints rather than airing them publicly. The safety complained last week about his lack of playing time in the wake of a last-minute loss to the Bills. Coach Dirk Koetter noted Ward, who’s missed two games with injuries, wasn’t in training camp with the Bucs and missed most of Denver’s training camp with a hamstring injury. With contributions from AP Sports Writers Tim Booth, Kristie Rieken, David Ginsburg, Fred Goodall and Larry Lage.